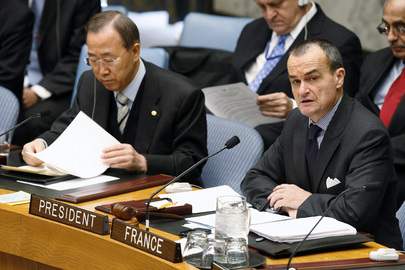 As UN Bans Press from Council Hall, Demand Tracks Back to Araud of France? UNITED NATIONS, April 6, updated -- The controversy over which Permanent Five member of the Security Council was most responsible for Monday's move to push the Press back to avoid "involuntary interaction" has taken a new turn. 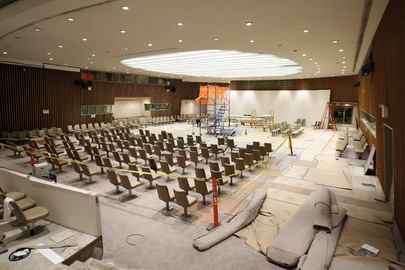 On April 5 the lack of clarity about who controls the UN building, and to some degree the press, came into focus when one or more Permanent members of the Security Council said reporters should be barred from hallway outside the new Council. At Monday's noon briefing, Inner City Press asked UN Deputy Spokesperson Marie Okabe who controls this space, the Council, the General Assembly, or the Secretary General. Ms. Okabe dodged the question, then said "the Member States, as you know, have a great say in this. This is their building. So, let’s leave it at that." Transcript here and below. But which member states -- the full 192 members, the 15 members of the Council, the Permanent Five -- or just a single one of the P-Five? While Inner City Press initially also named the United States, which called to deny involvement, multiple sources now identify French Permanent Representative Gerard Araud as the one who raised the issue in the Council's closed door session. It is perhaps not surprising. Of the Permanent Five ambassadors, Araud has gone the longest without taking questions from the Press at the stakeout or in a press conference. The UK's Mark Lyall Grant spoke most recently about Myanmar; Araud did not speak. The US' Susan Rice spoke about Sudan; Araud did not speak. Russia's Churkin held a press conference, ostensibly about road safety, but answered questions about NATO and Georgia, among others. But where is Araud? He does not lack wit and combativeness, so perhaps he will speak on the record now. From the beginning of his time at the UN in 2009, Araud has made a mark both with his caustic humor and his rudeness, which those invited call candor. In closed door sessions with chosen media, Araud has trashed a Middle East leader as "not all there." Of Guinea's military leader Dadis Camara, Araud said he "sleeps all day and drinks all night." When challenge by some media, he said "you are small people." Some French reporters say they welcome Araud's off the record candor. But to other French journalists, who along with Inner City Press have challenged him, Araud turns up his nose and walks by without a word. Then when it is written about, as Inner City Press did in a live blog of the opening of the UN's new North Lawn building, the French Mission to the UN takes to the phones to defend their boss' reputation. The next day at the (old) stakeout, Araud made a sarcastic point of saying hello. Perhaps then the seed was planted to try to use the Council's move as a pretext to avoid having to face or even see and be seen by the press before each Council session. Update of 9:40 am, April 6 -- already chairs and tables for non-Council member states are being put where the stakeout should be, with a penned in area further back for reporters. At the UN, too, apparently, possession is nine tenths of the law. Media Accreditation late on April 5 asked reporters to respect the lines drawn while this is all worked out. But on the other side, construction -- settlement -- proceeds. Update of 10:22 a.m.-- with the press corps penned in far back from the stairs, even the letters of protest could not be handed to Ambassadors as they entered. U.S. Ambassador Rice strode in. Even as reporters called out, "We have a letter for you," she smiled bemused and continued into the Council chamber. Later a spokesman accepted the letter. Tellingly, neither French Ambassador Araud nor his spokesman came to the tense stakeout. A member of the French mission blew the press a kiss, dramatically, and walked into the chamber. Inner City Press' introduction to Araud took place in a press conference on poverty in the Fall of 2009. Araud held forth about Sarkozy's and Kouchner's work. Inner City Press asked about France's eviction of asylum seekers in Calais, and treatment of the poor in Mayotte. Araud refused to answer, and afterwards complained. After he stormed by the table, outside the Security Council, where other Ambassadors stop to interact with the Press. Now, taking advantage of the Council's move to the basement, he has requested that the Press not be so close. While the U.S. denies agreeing to the request, it could have spoken up. As it is, a representative of the Secretariat's Security Council Affairs unit came out and said that in the consultations, the exclusion of the Press had been decided on. This has triggered an appeal to this month's Council president Yukio Takasu, copied to Ban Ki-moon, Ali Treki and all Permanent Five members. When Araud gets it, what will he do? Watch this site. Inner City Press: this morning in front of the Security Council, a representative in the Department of Political Affairs or the Security Council Affairs Unit said that the Council had decided that the press can’t stand in front of the Security Council; it should be pushed back, and that non-Council Members will be also in the hallway, in this area by the stairs. And that Security will enforce this. So, one, I wanted to know whether that’s a final decision by the Department of Political Affairs; and two, who controls safety and security here? Is it, does the Secretary-General, or do the Security Council Members, can they direct Security to make those moves? Deputy Spokesperson Okabe: I was just walking in here together with the head of the Media Accreditation Unit; and well, I didn’t have time to talk to her in detail, she has just had a meeting with Security and the Security Council Affairs Unit, and I think she has worked out something that enables closer access by the press to the Security Council members. So, she will give an update to Giampaolo, who I think just walked in. Inner City Press: But is it possible, I guess I’m just…the whole incident, the whole back and forth this morning, made me wonder kind of who is, I mean, obviously the Security Council can vote things about the world at large, but in terms of the building and space, is, does the Security Council control the building, or does the Secretariat and the Secretary-General control the building? Inner City Press: Does that mean the 15 or the whole, all 192? That’s what I am wanting to get at. Question: We have to find out those things. Inner City Press: Yeah, it’s very important. When you say Member States, is it only 15 or the full contingent? Deputy Spokesperson: The full contingent of what? Inner City Press: Of all Member States. I was told this morning that countries like India and Germany might have to, the new quiet room will be out by the staircase, not inside the room. So, I just wanted to know who decides that. Deputy Spokesperson: I think the arrangements, my understanding right now, Matthew, is that the Security Council has just moved from the traditional premises to the new ones. And I think a lot of the arrangements are in the middle of being worked out. So, until they do, I really don’t have enough information to comment further on the decision-making process. But, I do know that Media Accreditation is, was just talking to Security Affairs about this particular issue that came up this morning.